He has a great selection of dust jackets from Shute's books. 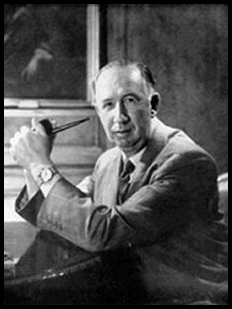 There seems to be a popular misperception that Nevil Shute's early novels are immature simply because they are, well, early. Shute protested too much about his first handful of novels, apologizing to readers in later editions for his imagined shortcomings. And the readers seem to buy it. Let me posit this: Marazan and So Disdained aside, the idea that Shute's early works are inferior to his later novels simply because he was still busy learning his craft is simply untrue. As in any period of his career, his novels varied in quality from one to the other. Some later novels are not of the first rank (In the Wet immediately springs to mind); neither are some early ones (Landfall and Ordeal, for example). The mustiness of these early plots and the importance of the action in the overall construction of the novels tends to distract from their other pleasures. In later masterpieces like Round the Bend and Trustee From the Toolroom, those plot elements which have dated badly - and there are certainly many - are more easily ignored, since the personal odysseys at the core of those stories are conveyed more forcefully. So then, to Lonely Road. The story is a primitive espionage thriller: Malcolm Stevenson, a wealthy, middle-aged shipbuilder is drawn into an international Communist conspiracy when, on a drunken drive home to his coastal estate, he stops his car and accidentally discovers and is assaulted by gun-runners unloading their cargo on English shores. Through a series of thoroughly implausible coincidences, Stevenson becomes involved with an English security agency trying to unmask the conspiracy. Through all this, he meets - and falls in love with - a girl who is somehow related to the gun-runners. The story twists here, turns there, and eventually winds up at somewhat surprising and reasonably satisfying conclusion. But this novel, as its title suggests, is really about a man who travels his own, solitary path. Despite his privileged background (or perhaps because of it), Stevenson does not know how to have friends, does not know how to court a woman, and by his late 30s has lapsed into a bitter, lonely life. He has learned to feign contentment with his few outlets, primarily drinking and caring for ships. And one night, events are set in motion that change all this. Shute has rarely been better at getting into the thoughts of one of his characters, painting a complex portrait of an unusual man with good intentions who lacks the instinct for how to act on them. Early?? Certainly. Immature? I think not.